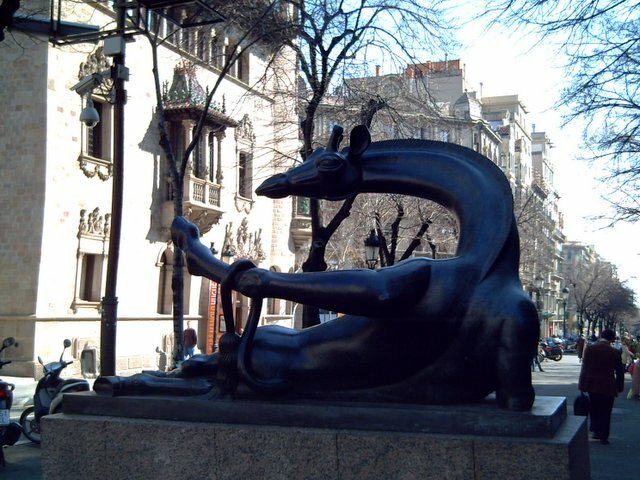 This graceful giraffe is called Coqueta (coquettish) and with it you enter Rambla de Cataluña through the mountain side (in Barcelona when you give directions everything is mountain side or sea side). The sculpture was made by Josep Granyer in 1972. At the far end of this long avenue, that is, sea side you will finally meet a bull, a bronze one of course by the same artist. This main artery is a must if you travel to Barcelona because of the sights, the architecture and the great variety of restaurants and shops in the area. Funny sculpture. I don't understand why a giraffe though... And the building in the background is beautiful, too. Is it anything special?